© Absolute Misdemeanor™®: What is your price? Everyone does indeed have a price and it doesn’t always involve money. If you are asked to eat a live cockroach in exchange for 2 tickets to watch Manchester United at Old Trafford, all expenses paid – would you do it? How about spending six months in total isolation in return for a luxury condo in Mont Kiara? What about cutting off your thumb for a good sum of money? What about killing a puppy? What about approving a faulty bridge? What about granting a project to a lousy contractor? What about voting for a crook? What about supporting a corrupt leader? The question is what is your price? How about RM 5 million? Okay, okay. What about RM10 million? Or RM 20 million? Or RM 50 million? Each of us has a price. Even those who speak of the truth and justice have a price. 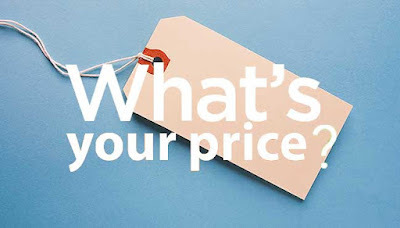 What is your price? A person’s price depends on a lot of variables – how desperate are you for money? Are you close to having your power cut off? Are you not able to pay rent? Are you ashamed of not being able to be a good provider for your family? Are you lonely and in need of love and affection? Are you tired of being a shadow? Do you dream of having more power and higher status? For someone with a sick mother, the price may be full medical treatment for mom. For someone living in poverty, the price may be a stable job. For someone with school going children, the price may be full scholarships to a reputable institution. To some who don’t know where their next meal is coming from, the price may be BR1M. I believe everyone has a price – you just have to find out what it is. Those who refuse to accept this fact may simply be trying to take the high road. But if we put our egos aside and think practically, I bet many of us are willing to negotiate our terms. What would you do if your parent’s life or your children’s future or your loved one’s dignity or your own well-being depended on it? Like I said everyone has a price. If I ask you to do something against your principle, would you do it? If I offer you more money than you have ever seen in your life, would you do it? If the money had the power to change your life for three generations to come, would you still hesitate? What if I guaranteed that nothing will go wrong? What if you had power, status and connections to ensure your protection – would you do it then? Having an extra million or two can never hurt. I mean you get to finally stop struggling. You may even be able to get off the nine to five grind. You get to spend more time with your loved ones. You get to help people. You get to choose the career path you are more likely to enjoy. You get to explore your passion, your hobbies. You get to wake up with a smile and go to bed with a smile. So would you do it? Everyone has a price – even those who already have it all. Some are never content with what they have – nothing seems enough. Some use their power and position to name their price. Some willingly surrender their rights and freedom for a price. Some close their eyes to fraud committed by others for a price. Everyone comes with a price. Everything comes with a price. I know this is depressing, yes. But it is the truth nonetheless. None of us are saints. Everyone can be bought for the right price. No one is without a price – not me, not you, not the Opposition and not the Government. So what do we do then? Do we simply accept what has happened because well “everyone has a price”? Or do we do something about it because the cost of doing nothing will be disastrous. The price we will have to pay for looking the other way may be too much.